The truth is it’s pretty difficult to get bored of the barbeque, but in case you’re looking for something more inspired (and healthy!) 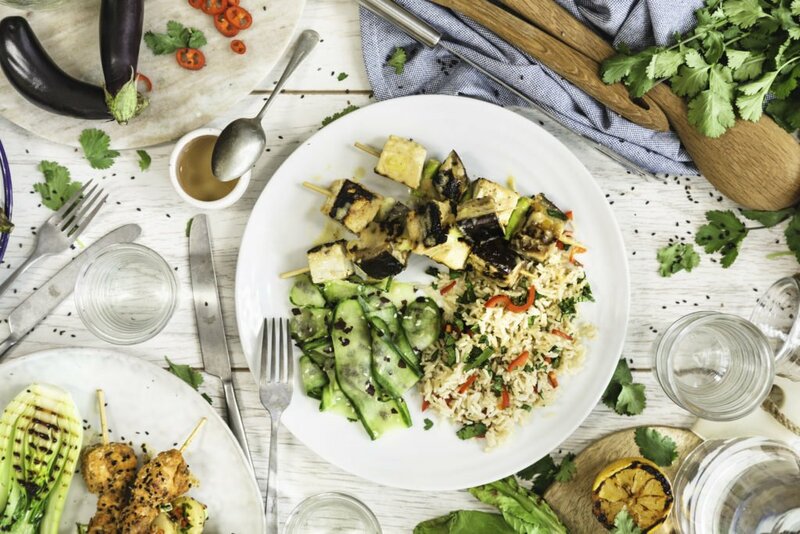 then the the bangers and the burgers – we’ve asked our friends at Mindful Chef to suggest three of their best BBQ dishes. Drain and rinse the tofu, pat dry with paper towel. Cut the tofu into 2cm cubes (you don’t want bigger pieces than these or they will take longer to cook). Cut the aubergine into 2cm cubes so that they are the same size as the tofu. Slice the spring onions into 2cm pieces also. Boil a kettle. Slice the apricots into quarters and de-stone. Trim the broccoli stalks. Remove the skin from the red onion, trim the root end but don’t cut off as you want the layers to stay intact when you grill them. Cut the red onion into quarters. Rub the vegetables with 1/2 tbsp oil and a pinch of sea salt. Rinse the quinoa and place in a saucepan with 300ml boiling water and a pinch of sea salt. Simmer for 15 mins. Remove the fat from the pork. Slice each pork loin into 8 pieces. Thread 4 pieces of pork and 4 apricot quarters onto each of the skewers. Drizzle over 1/2 tbsp oil and sprinkle with sea salt and black pepper. Preheat the BBQ (griddle pan) to a medium-high heat and cook the pork and apricot skewers for 15 mins turning every 3-4 mins, until the pork is cooked through. At the same time, add the onion quarters and broccoli stalks to the BBQ (or griddle pan) for 3-4 mins until softening and chargrilled. Drain the quinoa and stir through the dried oregano, pistachios and half of the lemon juice. Spoon the quinoa onto two warm plates and serve alongside the chargrilled onions and broccoli. Top with the pork and apricot kebabs and drizzle over the remaining lemon juice. Boil a kettle. Rinse the buckwheat and place into as saucepan with 300ml boiling water and a pinch of sea salt. Simmer for 15 mins, then drain. Pull any leaves off the cauliflower and trim the stem. Slice two 1-2cm thick ‘steaks’ from the centre of the cauliflower, from the base to the top. Remove the skin from the red onion, trim the root end but don’t cut off as you want the layers to stay intact when you grill them. Cut the red onion into quarters. Cut the pomegranate in half, remove and reserve the seeds. Roughly chop the mint leaves and break the walnuts in half. To make the harissa hummus; drain the chickpeas, reserving 1 tbsp of the liquid. Place in a bowl and mash the chickpeas until they are all crushed. Stir through the harissa, the juice from a quarter of the lemon and season with sea salt and black pepper. 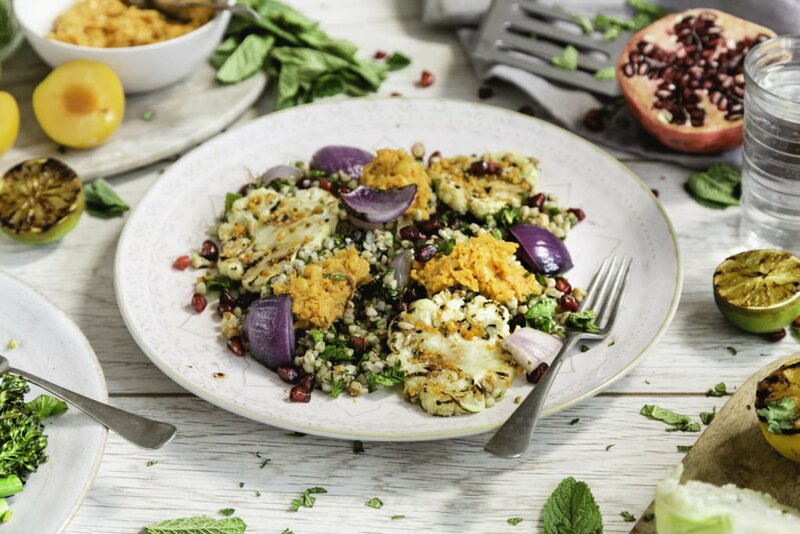 Brush the cauliflower steaks and red onion with 1 tbsp oil and season with a pinch of sea salt and black pepper. Heat the BBQ (or a griddle pan) to a medium-high heat and cook the red onion and cauliflower steaks for 3-4 mins each side until softened. To make a dressing, in a bowl, mix the juice from a quarter of the lemon with the pomegranate molasses. Chef’s tip: you can grate the remaining cauliflower and use cauliflower rice. Got any more BBQ tips? Let us know over on Instagram. 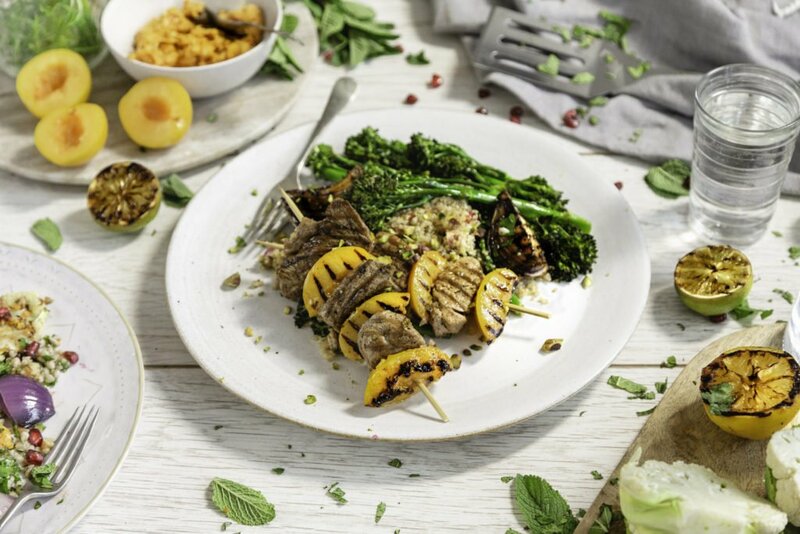 To get delicious healthy recipes just like these delivered straight to your door visit Mindful Chef, where all bubble Plus customers will receive 25% off their first two boxes. Mindful Chef recipe boxes provide you with the tools to cook delicious nutritious meals, in under 30 minutes. Each box contains recipe cards, pre-portioned ingredients and fresh meat, fish and produce sourced from small award-winning British farms.